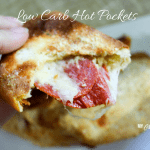 Low Carb Hot Pockets – tender, low carb dough filled with all your favorite pizza flavors. These hot pockets can be frozen after they are baked, then reheated in the oven. This recipe is low carb, gluten free, and a Trim Healthy Mama S Fuel. Those of you who follow me on Facebook may remember that I am in the middle of a 100 day no-cheat challenge. My family went away last weekend for a few days, and I knew that if I wanted to stay on-plan, I would have to plan ahead. I am convinced that planning ahead is half (or more) of the battle when it comes to staying on plan! Planning ahead is crucial. My family was planning to have pizza one night, so I whipped up these hot pockets. I may or may not have eaten one straight out of the oven (ok, I DID)! I cooled them, put them in a Ziploc baggie, and then re-heated them in the oven. They were perfect! I’m quite sure that you could also freeze these after baking. Keep them in your freezer, then reheat in the oven! 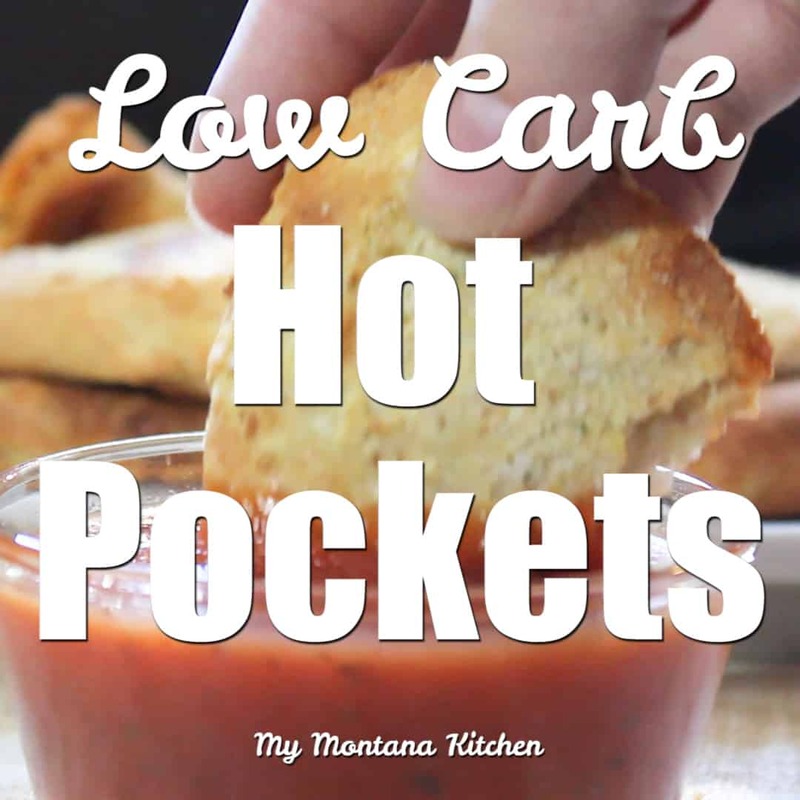 Can you imagine how awesome it would be to have your freezer stockpiled with these low carb hot pockets? Planning ahead at its best! There are so many different flavor combinations! I’ve listed a few of them below. If you have another favorite flavor, leave me a comment and let me know! 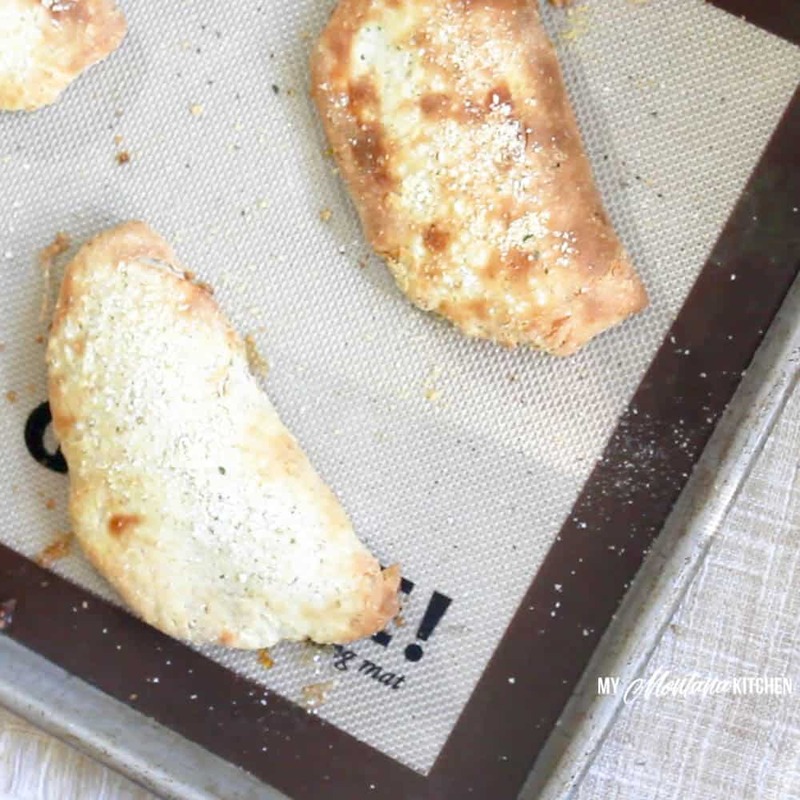 These hot pockets use a variation of the popular “Fathead” dough. 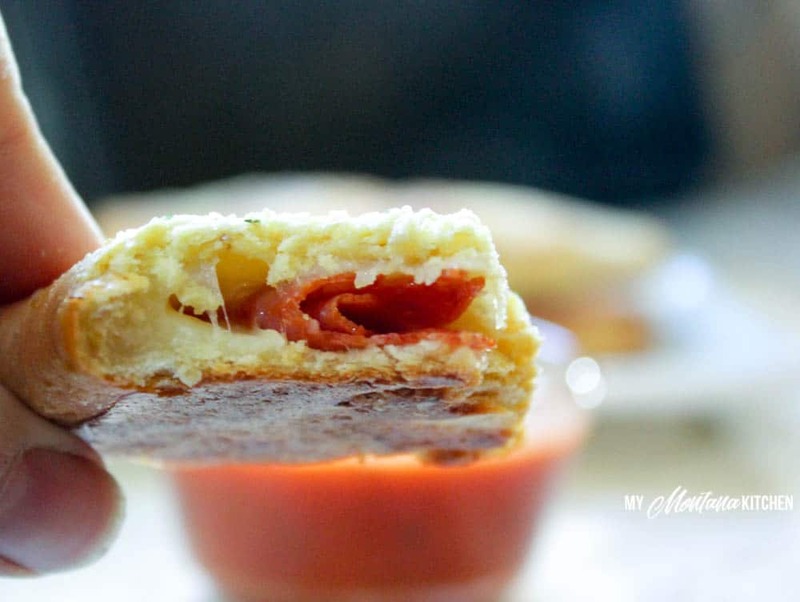 I originally adapted that recipe to make Low Carb Stromboli. I wanted to replace some of the almond flour with Trim Healthy Baking Blend. If you have never heard of the Trim Healthy Mama Baking Blend, let me explain a bit. This is a pre-mixed blend of low-carb flours that are perfect for baking! The Baking Blend consists of oat fiber, organic coconut flour, golden flax meal, blanched almond flour, collagen peptides, and glucomannan (organic konjac extract powder). And it is completely gluten free! Compared to straight almond flour, the Baking Blend is much lighter in calories. Now, as a Trim Healthy Mama, I do not count calories (but I do try to keep from abusing them)! Almond flour has 648 calories per cup, compared to Baking Blend’s 240. You can see why I love this product! However, if you do not have the Baking Blend, you can use straight almond flour in this recipe. But I would encourage giving the Baking Blend a try! To see just how easy these are to make, check out my video below. In a large glass bowl, melt mozzarella cheese and cream cheese together. Mix well, then add egg. Mix again, then add baking blend. Knead well with hands until you have a homogenous dough (It should be a very even consistency). Divide dough into four balls. Between two sheets of parchment paper, flatten each ball into a 6-8 inch circle. Fill each circle with filling of your choice. Fold circle in half and seal the edges (see video above for how-to). Place on a cookie sheet covered with parchment paper or a baking mat. Brush the tops with egg whites. Bake for 12-15 minutes, or until tops are golden brown. Please note that nutritional information is calculated WITHOUT fillings. The filling will change the nutritional counts according to what you use. Looks great. Can’t wait to try the recipie. I’m going to use ricotta, mozzarella, mushrooms and a little tomato sauce- a low card calzone! Yes, you should be able to put sauce on the inside. As for the broccoli, I just finely chopped some broccoli, then instead of the cheese and pepperoni, I used a couple Tablespoons broccoli, then I laid 1 slice of cheddar cheese on top and sealed the edges. Have you tried reheating in the microwave? I would love to take these to work along with a salad or broccoli and dip. Yes, I have reheated them in the microwave (but not from frozen). They are ok, but the texture is different than if reheated in the oven. Oh these look SO delicious! Great idea for party food! These are perfect for my snacking family! Pesto & chicken with mozzarella would be yummy! If I don’t have baking blend, what can I use? could I use the frugal flour recipe instead of regular baking blend? I can’t wait to try these tonight. Great lunch idea for on the go. I would like to make a double batch, but I have enought baking blend to make one. Can I do half the blend and half almond flour for each batch? How would I make them with bacon & eggs? Would I scramble the eggs first? Yes, just add scrambled (cooked) eggs and pieces of cooked bacon. Just made these for my little family along with some fresh veggies and THM’s Strawberry Cheesecake Shake, and the meal was a huge success, so I wanted to say thank you for this recipe. 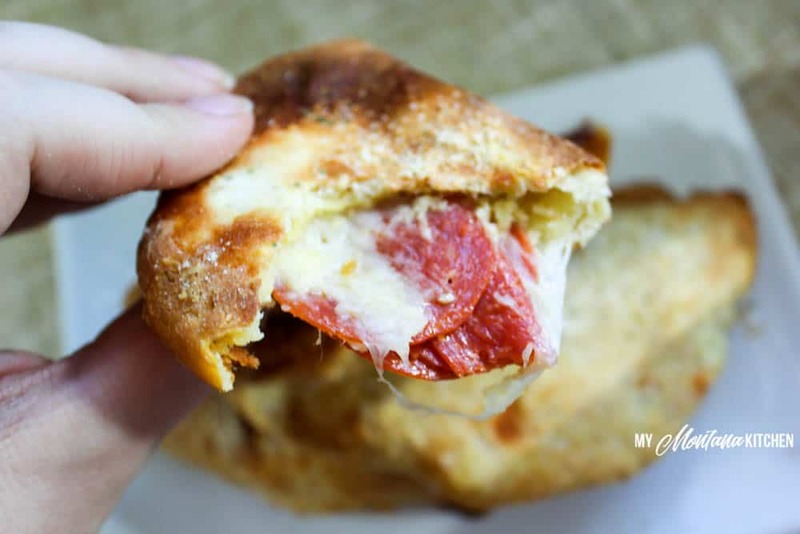 I think it can be hard to get used to baking blends, but the pepperoni and cheese inside of the pocket helps to mask the flavors of the baking blend for those who are not used to it.